Na Pali displays Kauai’s most spectacular coast. This excursion traverses the first two miles of rugged, historic Kalalau Trail then another two miles interior up Hanakapiai Valley to the base of it’s majestic 400-foot waterfall. Prepare for a visual feast of soaring, jungly-green pinnacles rising from black lava cliffs, all backdropped by sapphire, teal or turquoise seas, depending on the mood of the North Pacific. This is Na Pali (“The Cliffs”), the crowning coast of Kauai. Sea cliffs composed of thousands of five million year old lava flows rise up to as much as 4,000 feet and extend 13 miles along one of the world’s most precipitous coastlines. 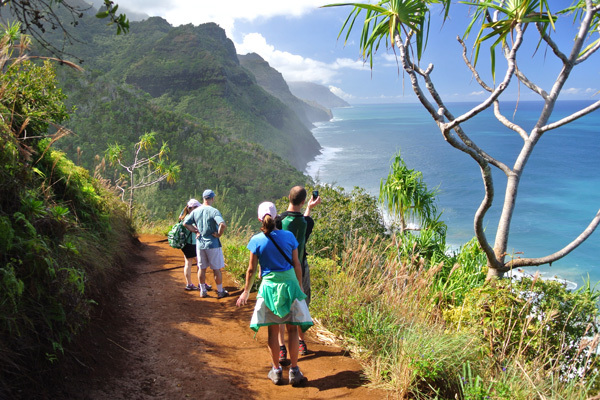 As your knowledgeable guide leads you safely along the historic Kalalau Trail and then up Hanakapiai Valley, you will learn of Na Pali’s geological origins, the stories of Kauai’s native plants and animals, and of its cultural past. Coastal valleys, such as Hanakapiai, were settled by the island’s earliest human occupants over 800 years ago and then abandoned as resources dwindled. The two-mile hike up Hanakapiai Valley passes much of the evidence of that occupation – numerous archaeological sites. Prepare yourself for discovery – visual treats, geological origin, botanical struggles and human exploitation. This moderately difficult to strenuous out and back trail adventure ranges from a moderate four mile (round-trip) option to Hanakapiai Beach, to an eight mile (round-trip) excursion that includes Hanakapiai Valley to the very base of its 400-ft waterfall. North coast weather, and thus, trail conditions are variable – sometimes rather wet and muddy. Our van leaves Poipu Beach Park at 8:00am and picks up along the East and North sides of the Island. We return to Poipu by 6:00 to 7:00pm, depending on trail conditions. Included is a fresh deli-style lunch, bottled water, snacks and fruit. Day packs are provided, if needed, for you to carry your lunch, water and personal items. Study walking/hiking footwear is recommended. Prepare for wet muddy conditions. We suggest bringing a change of clothes for the return ride to Poipu and/or your island accommodation.